The front cover is your first impression, so make it a good one! WHAT TO INCLUDE Include the title + tagline on your ebook cover design, and the author’s name – duh! You can also include your business logo and/or website if you want (or just keep that on the back cover). Do NOT put the running head, footer, or a page number on the front cover. This page houses all your legal stuff like copyright, attributions to any sources referenced in your ebook, restrictions on how they can use the contents of your ebook (like not sharing it, etc.) and any disclaimers you need to mention before they dive into your content. WHAT TO INCLUDE Include copyright info for the current year, disclaimer info for how the reader can use the ebook (i.e. not sharing or reselling without permission), any sources you need to include (for example, if you’re using Bible verses, you have to include the translation’s source + copyright info on this page), and any other info you want the reader to know before diving in. Sometimes I also put my business logo + website on this page. Do NOT put the running head, footer, or a page number on this page. This page helps your reader get the lay of the land. Even if your ebook is short, this can be helpful to include for the reader to see how the content is organized, and they can skip around if need-be. If your copyright info and table of contents are fairly short, it’s okay to combine these into one page. WHAT TO INCLUDE Include a title for the page, the name of each section / chapter, and of course the page number to match it. In addition to the usual main content on your list, be sure to also include these pages: Introduction (before the main content), Resources / References (after the main content), and About The Author (after the main content). If you have interactive pages that coordinate with each chapter or section, you can also list them here for quick reference. Do NOT put the running head, footer, or a page number on this page. An introduction page is great to include as a welcome mat for your reader to get to know you and why you created this ebook, how to use it (especially if there are interactive parts to it), etc. WHAT TO INCLUDE Include a title for the page, 1-2 paragraphs introducing yourself (very briefly, you’ll have more room to share more at the end of the ebook), and what you’re about to teach them with this fabulous ebook. These pages also need a running head, footer, and a page number. This one is optional, but a title page introducing each section can be a great addition to longer ebooks to better divide the content and create a visual divide between sections. WHAT TO INCLUDE These pages usually just include the title of the section it’s introducing, but a brief sentence or tagline could be helpful if it seems bare. Do NOT put the running head, footer, or a page number on title pages. This is your meat! These pages are where you’ll dump all your main content, and will naturally be the bulk of your ebook. WHAT TO INCLUDE This is what you wrote! It will mainly be headings, paragraphs of text, and images sprinkled throughout. Each of these pages will also need a running head, footer, and a page number. These types of pages are optional, but can be helpful for the reader to start taking action on what you’re teaching. This can be worksheets, cheatsheets, checklists, trackers, planners, etc. WHAT TO INCLUDE Include a title for the page, and a brief description of how they can use that page (think back to your school days… they need instructions! ), then drop in your content for them to go through. These pages also need a running head, footer, and a page number. This page is another optional one, but another helpful one, too! This is where you can list out any external links to websites, other resources, etc. that relate to your content + enhance the reader’s understanding of the topic you’re teaching. WHAT TO INCLUDE Include a title for the page, plus links to websites you mentioned in your ebook, ones that they can go to to learn more about a particular subject, or ones that provide supplemental content. These pages also need a running head, footer, and a page number. An about page is vital for the reader to know your credentials for writing this, so they can trust that what they’ve learned is coming from an expert. This is also where they can go to learn more about your business. WHAT TO INCLUDE Include a title for the page, your business logo, a headshot of yourself (put a face with the name! ), a brief description of your business + background on the subject you just wrote about, and of course include links to where they can continue keeping up with you (website, email, social links, etc.). These pages also need a running head, footer, and a page number. Don’t leave ‘em hanging! I hate it when an ebook just ends on a random page, and I’m left wondering if there was a glitch in the download – it’s the worst! Give them some closure, and include a back cover. WHAT TO INCLUDE Include your website and logo, and that’s about it! You can even spice it up with an inspirational quote or final call to action! Do NOT put the running head, footer, or a page number on the back cover. This just in — the first mini-class from P+O! Was that helpful to you? I genuinely hope so! And if so, I've got some good news for you. 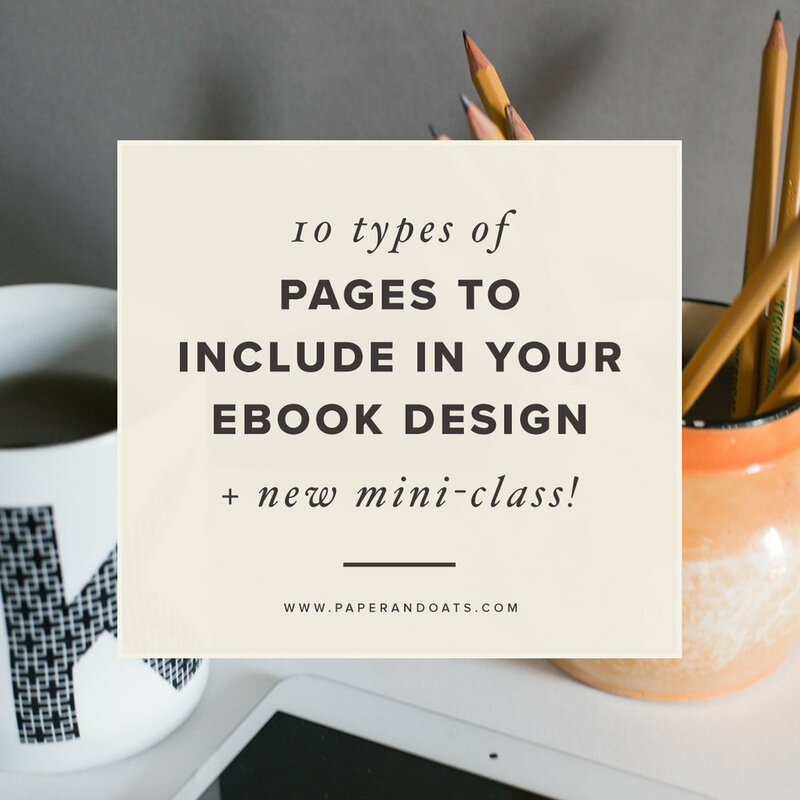 My very first mini-class just launched, and the topic is designing the perfect ebook! and all of these tools + principles will be taught on a real ebook template – 20 pages of InDesign goodness that you can swipe at the end of the class to jump start your own design! Sound good? Click below and let's get started on your ebook design! Take me to that mini-class! This guide will help you see the big picture as you start laying out your ebook, and can help you make some design decisions up front before you even crack open InDesign (or whatever program you’re using!). Drop in your name + email to download the E-book Starter Guide right now.